Today I am using a stamp from the Artistic Outpost, Snowy Woods set. If you are not familiar with Artistic Outpost stamps, you really should check out our vintage sets, especially the Christmas sets. My card is 5x7, and I used silver and white card stock with gold embellies. I love silver and gold together, and the mix of it with some red and a few other colors really makes for a beautiful card. The red is embossed with a new folder and the embellies are die cut. The snow was done with a clear Wink of Stella brush over some very light blue marker. Artistic Outpost has a monthly challenge open called, SHOW US YOUR ART! Check out the Artistic Outpost blog for more info. What a great stamp and card, Gerrie! You know I love vintage, so I just had to go and check out Artistic Outpost! I love the die cut embellies you have added to make this card special! Merry Christmas, my friend! 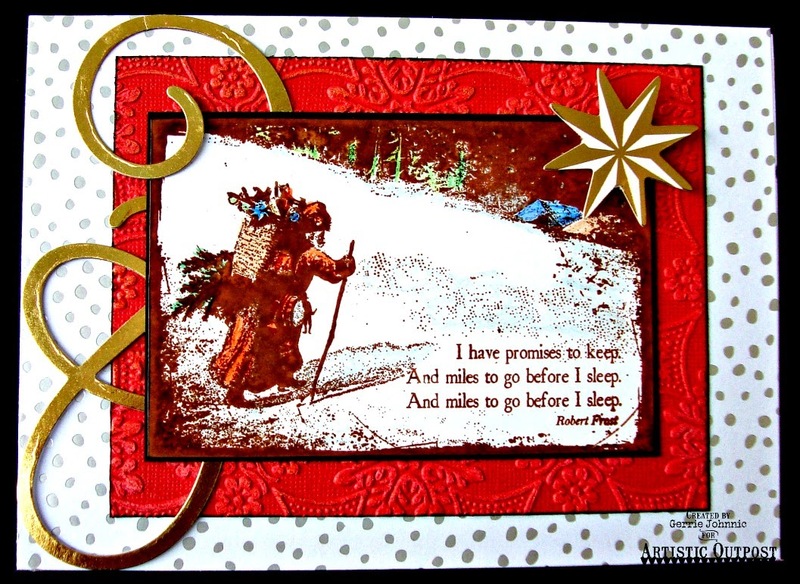 Beautiful Christmas card, love the added coloring and gold die cut embellies! Beautiful Christmas stamp, and I love how you tucked the card around the swirl! Hey GF Merry Christmas so far behind but catching up...your card is gorgeous and I feel like Santa miles to go before I sleep.